AppCommerce is a fully API based integration with WooCommerce. That means it won't display your theme or custom plugins (except on checkout), so all your customization happens in the app builder (or through the API). You can customize the shop and cart pages as much as you want by adding extra components. You must have the 1 required component (woo-list or woo-cart) on the page somewhere, but you can add whatever you want around that. Customize as much as you want. 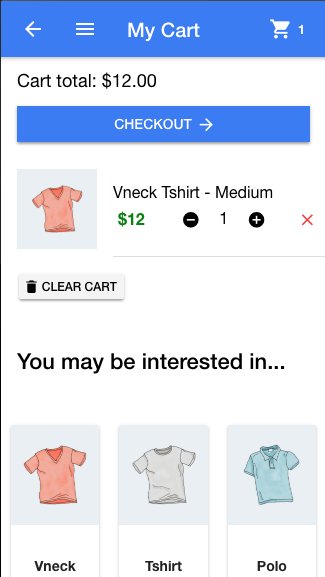 On your cart page, you could display some featured products to entice people to buy more. To display different products in your lists or sliders, for example from a specific category, you would use url parameters with the route. You can find other parameters for displaying products in the WooCommerce API documentation. To customize API responses further, you will need to use WooCommerce API hooks and filters that can also be found in their documentation. All AppCommerce pages except checkout are hardcoded into the app, so if you want to change the way they look, you have to use custom CSS. You'll need to use a browser inspector to find the CSS selectors, and then add those in the custom CSS box in your Design tab. This is an advanced customization technique, and we can only offer limited support.